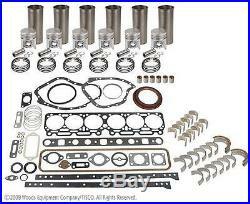 This is a Brand New Premium Quality Major Engine Overhaul Kit. It is for rebuilding the. Original John Deere 6.404T/A – (LATE SERIAL NUMBER RANGE) Turbo/After-cooled Series Diesel Engine in the following equipment. Please check Engine Serial Numbers Below and your BLOCK CASTING NUMBER. FITS Engine Serial Number After : 335846. John Deere COMBINE : 6600SH (After S/N # 305672 – Block # R49470, R49650, R59850, R72128, R87558). John Deere COMBINE : 6602 (After S/N # 163500 – Block # R49470, R49650, R59850, R72128, R87558). John Deere COMBINE : 7700 (After S/N # 8000 – Block # R49470, R49650, R59850, R72128, R87558). John Deere EXCAVATOR : 690B (Block # R49470, R49650, R59850, R72128, R87558). John Deere FELLER BUNCHER : 693B (Block # R49470, R49650, R59850, R72128, R87558). John Deere FORAGE HARVESTER : 5200 (After ESN # 335846 – Block # R49470, R49650, R59850, R72128, R87558). John Deere FORAGE HARVESTER : 5440 (Block # R49470, R49650, R59850, R72128, R87558). John Deere LOG SKIDDER : JD740 (Block # R49470, R49650, R59850, R72128, R87558). John Deere TRACTOR : 4430 (Block # R49470, R49650, R59850, R72128, R87558). John Deere TRACTOR : 4630 (Block # R49470, R49650, R59850, R72128, R87558). John Deere TRACTOR : 7020 (After ESN # 335846 – Block # R49470, R49650, R59850, R72128, R87558). Included in this kit. 6 x Piston, Rings, Liner Kit (1.61 or 41mm Wrist Pin Diameter). 1 x Main Bearing Set w/ Thrust Washer Set – STD. 1 x Connecting Rod Bearing Set – STD. 1 x Front Engine Seal. 1 x Rear Engine Seal. 6 x Connecting Rod Bushing. 12 x Connecting Rod Bolt. 4 x Camshaft Bearing. 1 x Full Engine Gasket Set. Kit Weight : 105 lbs. Diesel – Turbo. Bore : 4.25 (108mm). Wrist Pin Diameter : 1.61 (41mm). Block Casting # R49470, R49650, R59850, R72128 or R87558. THERE IS HIGH COMPRESSION UPGRADE KIT AVAILABLE FOR EASIER STARTING – PLEASE ENQUIRE. PLEASE BE ADVISED this kit comes with standard bearings unless you advise us you require another size. Don’t Settle for Second Best, when it comes to choosing an engine kit supplier. 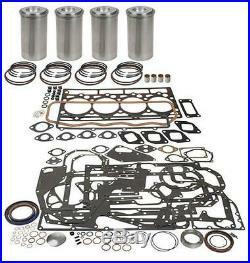 TractorPartsDirect engine kits are unsurpassed when it comes to quality. Many of our suppliers are the same suppliers that sell to original equipment manufacturers. Our cylinder components are manufactured to OEM specifications and will restore tired engines to their original level of performance, maintaining that level for years to come. Our engine products represent the latest in manufacturing technology. TractorPartsDirect engine kit suppliers commitment to continuous improvement acts as the catalyst toward the development of innovative CAD/CAM designs and CNC manufacturing of cutting-edge, high quality products. Heavy-duty permanent mold pistons are cast with ni-resist inserts bonded into the top or the top and second ring grooves. These metallurgical, high nickel content iron inserts extend the life of the pistons by reducing groove wear. Close tolerance ring groove specifications prevent blow-by, assuring. Our liner packings are molded with the latest compounds such as viton, which remains pliable and resilient for thousands of engine hours. Plus, our piston rings offer you superior materials and trouble free installation. Premium ring sets contain moly or chrome faced top compression rings for longer wear under severe operating conditions…. In addition, our gasket kits and bearings come from quality suppliers and are designed to “fit” the application in question. We Have These Overhaul Kits in Stock in Canada and the USA for further information please contact. Sean (AT) tractorpartsdirect (DOT) com. Or call toll free: 1 877 319 0059. The item “JOHN DEERE 6.404T/A MAJOR ENGINE OVERHAUL KIT LATE 4430 4630 690B 693B 5440″ is in sale since Monday, June 27, 2016. This item is in the category “Business & Industrial\Heavy Equipment Parts & Accs\Tractor Parts”. The seller is “tractorpartsdirect” and is located in Indianapolis, Indiana. This item can be shipped to North, South, or Latin America, all countries in Europe, all countries in continental Asia, Australia. This is a Brand New Premium Quality In-Frame Engine Overhaul Kit. It is for rebuilding the original John Deere 4.239T TURBO Diesel (300 SERIES) Engine in the following equipment. Please check Engine Serial Numbers Below. John Deere LOADER BACKHOE : 310C (w/ 4.239T Turbo Engine). John Deere LOADER BACKHOE : 310D (w/ 4.239T Turbo Engine). John Deere LOADER BACKHOE : 315C (w/ 4.239T Turbo Engine). John Deere LOADER BACKHOE : 315D (w/ 4.239T Turbo Engine). John Deere LOADER BACKHOE : 515B (w/ 4.239T Turbo Engine). John Deere EXCAVATOR : 490 (w/ 4.239T Turbo Engine). John Deere TRACTOR : 1052 (w/ 4.239T Turbo Engine). John Deere TRACTOR : 1155 (w/ 4.239T Turbo Engine). John Deere TRACTOR : 2140 (w/ 4.239T Turbo Engine). John Deere TRACTOR : 2450 (w/ 4.239T Turbo Engine). John Deere TRACTOR : 2555 (w/ 4.239T Turbo Engine). John Deere TRACTOR : 2650 (w/ 4.239T Turbo Engine). John Deere TRACTOR : 2750 (w/ 4.239T Turbo Engine). John Deere TRACTOR : 2755 (w/ 4.239T Turbo Engine). John Deere TRACTOR : 2850 (w/ 4.239T Turbo Engine). John Deere TRACTOR : 2855 (w/ 4.239T Turbo Engine). John Deere WINDROWER : 3830 (w/ 4.239T Turbo Engine). Included in this kit. 4 x Piston, Rings, Liner Kit. 1 x Connecting Rod Bearing Set – STD. 8 x Connecting Rod Bolt. 1 x Top Gasket Set. 1 x Oil Pan Gasket Set. Kit Weight : 60 lbs. Bore : 4.19 (106.5mm). Wrist Pin Diameter : 1.625 (41mm). Connecting Rod Casting Number : R80032, R113612, R122191. PLEASE BE ADVISED this kit comes with standard bearings unless you advise us you require another size. Don’t Settle for Second Best, when it comes to choosing an engine kit supplier. TractorPartsDirect engine kits are unsurpassed when it comes to quality. Many of our suppliers are the same suppliers that sell to original equipment manufacturers. Our cylinder components are manufactured to OEM specifications and will restore tired engines to their original level of performance, maintaining that level for years to come. Our engine products represent the latest in manufacturing technology. TractorPartsDirect engine kit suppliers commitment to continuous improvement acts as the catalyst toward the development of innovative CAD/CAM designs and CNC manufacturing of cutting-edge, high quality products. Heavy-duty permanent mold pistons are cast with ni-resist inserts bonded into the top or the top and second ring grooves. These metallurgical, high nickel content iron inserts extend the life of the pistons by reducing groove wear. Close tolerance ring groove specifications prevent blow-by, assuring. Our liner packings are molded with the latest compounds such as viton, which remains pliable and resilient for thousands of engine hours. Plus, our piston rings offer you superior materials and trouble free installation. Premium ring sets contain moly or chrome faced top compression rings for longer wear under severe operating conditions…. In addition, our gasket kits and bearings come from quality suppliers and are designed to “fit” the application in question. We Have These Overhaul Kits in Stock in Canada and the USA for further information please contact. Sean (AT) tractorpartsdirect (DOT) com. Or call toll free: 1 877 319 0059. The item “JOHN DEERE 4.239T TURBO INFRAME ENGINE OVERHAUL KIT 310C 490 1155 2450 2555″ is in sale since Monday, June 27, 2016. This item is in the category “Business & Industrial\Heavy Equipment Parts & Accs\Tractor Parts”. The seller is “tractorpartsdirect” and is located in Georgetown, Ontario. This item can be shipped to North, South, or Latin America, all countries in Europe, all countries in continental Asia, Australia.